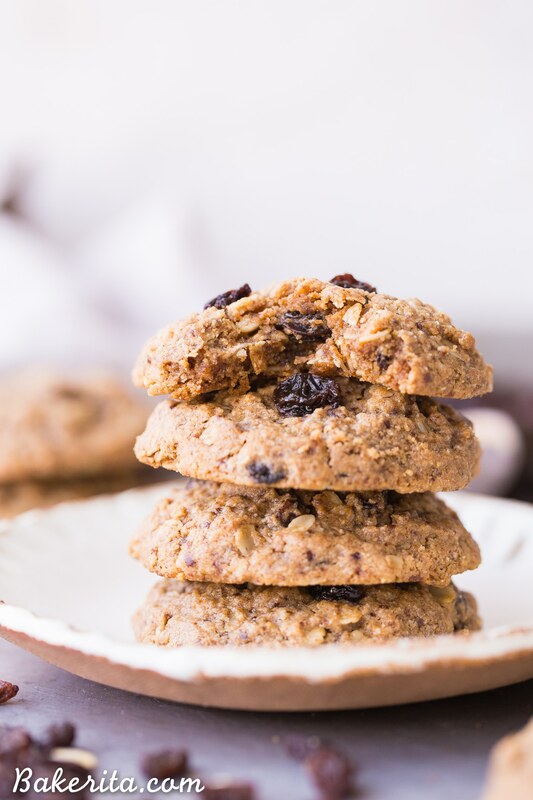 These Peanut Butter Oatmeal Raisin Cookies are the best oatmeal raisin cookies I’ve ever had! They’re incredibly soft and chewy, with crispy edges and MAJOR peanut butter flavor. You won’t believe they’re gluten-free, refined sugar-free and vegan. 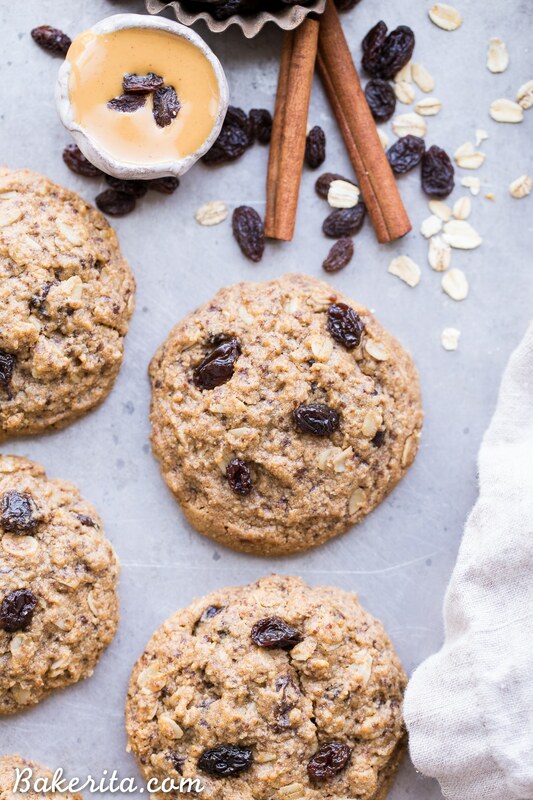 You’ve all seen the funny quote saying, “Raisin Oatmeal Cookies that look like Chocolate Chip Oatmeal Cookies are the reason I have trust issues,” right? Normally, I’m right there with the author of that saying. Gimme all the chocolate! But, I’ve got a recipe here that might change your mind and have you diving right into these, raisins and all. A few months back, I made a homemade Cinnamon Raisin Almond Butter. Good Lord, that stuff was addictive. Ever since, I’ve been a bigger fan of raisins, and the sweet burst of chewiness they bring to the recipes they’re in. 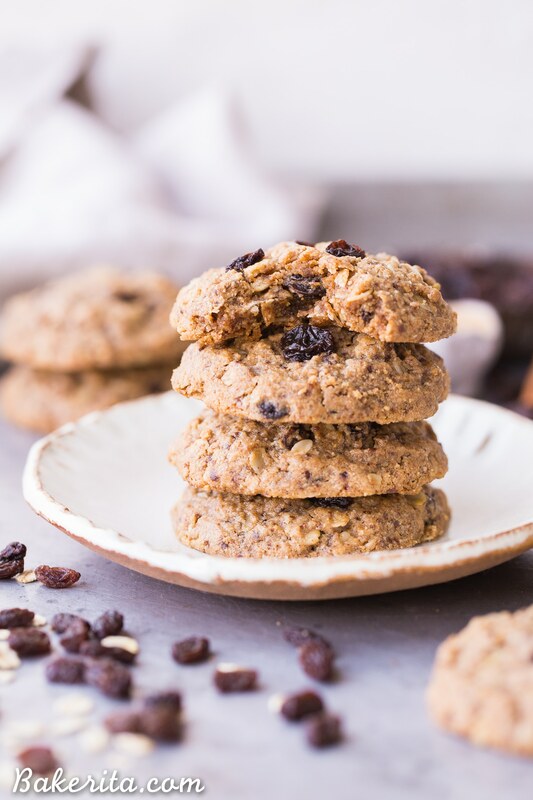 I was recently having a hankering for a super peanut buttery cookie that was full of texture, and these Cinnamon Raisin Peanut Butter Oatmeal Cookies came to mind. Of course, those are an old recipe that’s full of sugar, butter, and a bunch of non-vegan and non-gluten free ingredients. But since they were SO good the first time around, I figured it was worth a shot at converting them into a gluten-free, refined sugar-free, vegan masterpiece. Challenge was a SUCCESS! Dang, you guys, these cookies are irresistible. I wish I could hand each of you one of them so you could see for yourself. I’m normally not the biggest peanut butter cookie lover ever (I’d rather just eat it with a spoon) and my boyfriend Jesse claims he normally doesn’t like raisin cookies…yet each of us totally demolished a few of these. They’re SUPER peanut buttery, with a little bit of texture and chew from the oats, and a burst of sweetness from the raisins. 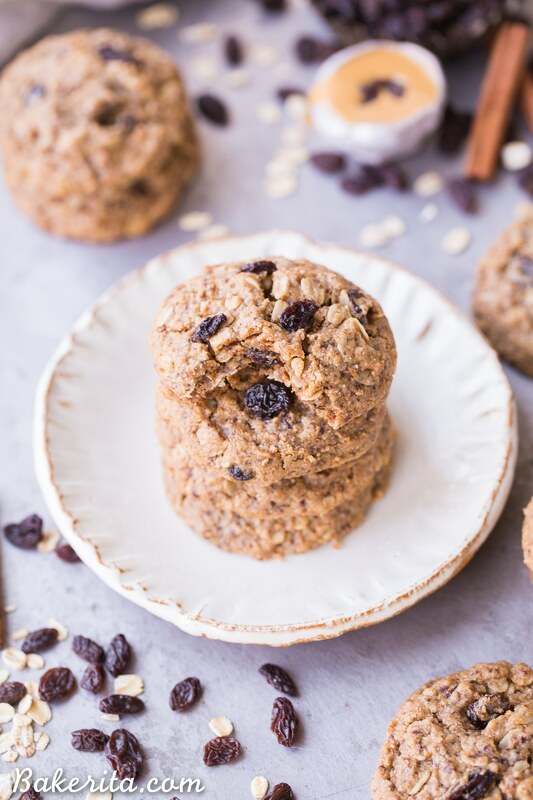 These Peanut Butter Oatmeal Raisin Cookies also have some cinnamon added for some additional warmth, which always plays so well with the oatmeal raisin flavor combination. The texture of these cookies is soft and chewy – don’t expect crunchy cookies with this one! I tested the recipe with a real egg and a flax egg, and both were fabulous, but with the flax egg, they were a little crumblier when warm. Make sure they’re cooled completely on the baking sheet before trying to remove them so you don’t end up with cookie crumbles! 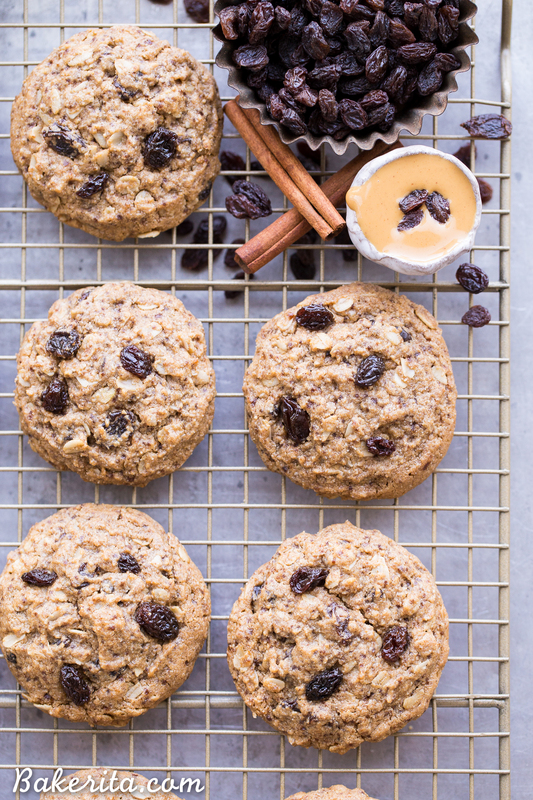 If you’re a peanut butter nut like me, and can’t get enough of oatmeal cookies, these are for YOU. And of course, if you absolutely can’t give up chocolate, sub in some chocolate chips for the raisins  I hope you’ll give these a go, and enjoy! You’ll want to dig into this Chocolate Peanut Butter Oatmeal for breakfast. Got figs? Then you’ve got to try these Oatmeal Fig Bars. Impress your guests with little effort by serving up this Blueberry Crisp Tart with Oatmeal Crust. These Peanut Butter Oatmeal Raisin Cookies are the best oatmeal raisin cookies I've ever had! They're incredibly soft and chewy, with crispy edges and MAJOR peanut butter flavor. You won't believe they're gluten-free, refined sugar-free and vegan. In a large bowl, cream together coconut oil and coconut sugar until light and fluffy. Beat in peanut butter and vanilla extract. Beat in the egg or flax egg until well blended. Combine the oats, almond flour, baking powder, baking soda, salt, and cinnamon. Add into the peanut butter mixture and beat until just combined. Fold in raisins. Chill cookie dough, covered, at least 2 hours and up to 1 week. Preheat oven to 350°F. Form rounded tablespoons of dough into balls and arrange about 2 inches apart on baking sheets lined with parchment paper. Bake cookies in batches in middle of oven for 12 minutes, or until just pale golden. Cool cookies completely on the baking sheet before removing and serving. The peanut butter makes these outrageously good! Thanks so much Traci. These days I automatically opt for nut butter in all my cookies. These look perfect! Looks so yummy Licious Rachel. I am a huge fan of Peanuts and Peanut butter. 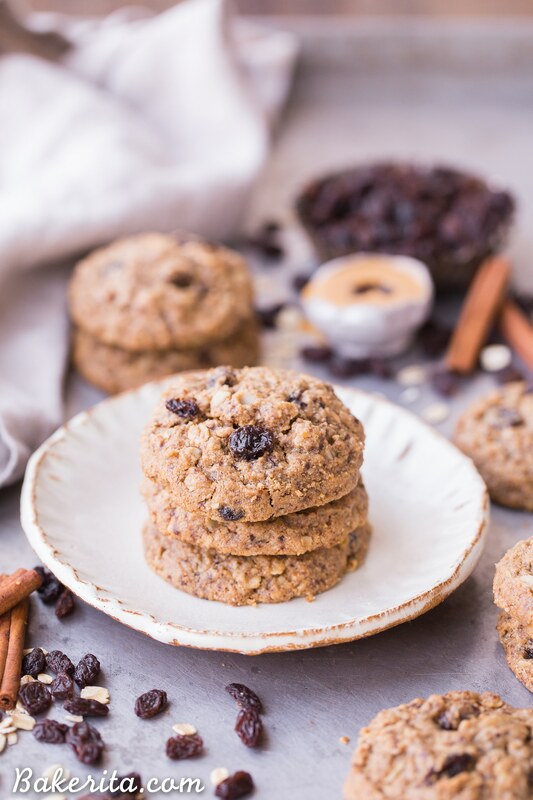 Cookies look so delicious and healthy too because of the oatmeals. Will surely make it asap and eat every day. But please do let me know- For how many days I can store this yummy thing? Best wishes and Regards. You should be able to keep them at room temperature for about 3 days, or in the fridge for up to a week! Enjoy. These sound delicious and I can’t wait to make them! But can I substitute the coconut sugar for honey?? You might be able to but it would definitely affect the texture of the cookie. I’d recommend sticking with coconut sugar for the best results. Hi Rachel! I just found your beautiful, delicious site! Thanks for these great recipes. I don’t love the essence of coconut oil in baked goods. Can you swap it out for ghee? If so, what’s the proportion? Thanks! Hi Mallory, you should be able to use ghee in the same amounts without issue. Enjoy! I made the vegan version with flax egg and they definitely fall apart, even when completely cooled. It’s too bad because they are quite good. Sorry you had trouble with them crumbling, Melanie! I found they didn’t crumble as much when cooled so I’m not sure what happened there! Hi Rachel! I want to try to make these from what I have in the cupboard (but don’t have almond flour or coconut sugar!) What proportion normal flour would you use (and I might try sub-ing maple syrup for coco sugar, and add flour to compensate)…? Hi Elene, I would use the same amount of regular flour – not sure how much you would need to add to switch in for maple syrup though since the recipe wasn’t developed that way. Good luck! I have made these several times and they are amazing! They never flatten however. Have you ever tried making them without chilling the dough first? Thank you so much for this recipe! Hi Carrie, no I haven’t but you certainly can if you want a thinner cookie! Glad you’re enjoying them.